The annual report on organized crime in agriculture confirmed the efficiency of Italian law enforcement with greater international cooperation. The fifth report on agri-food crimes in Italy was presented in Rome on Tuesday, 14 March 2017 at the Congress Center Palazzo Rospigliosi. More than 200,000 checks were carried out by Italian authorities in 2016 to fight food crimes and lead the country to the highest level of food safety in the world. This was the finding from the fifth report on agri-food crimes by the Italian farmers’ group Coldiretti, the Institute for Political, Social and Economic Studies (Eurispes) and the Agromofia Observatory. A daily monitoring activity was implemented by several law-enforcement agencies including the Carabinieri (anti-adulteration and anti-fraud units are now supported by the Command Unit for the forestry, environmental and agri-food protection CUTFAA, which was formerly known as State Forestry Corp); the Organized Crime Investigation Service of Financial Police (SCICO); the Central Inspectorate for the protection of quality and fraud prevention of food product (ICQRF), and the Coast Guard. Moreover, Italian law enforcement ensures protection not only to national consumers but also through the international markets, especially since organized crime started to exploit the many possibilities offered by the Internet. Increasing attention is being paid by control bodies to the extraordinary development of the online food market over the past 5 years which facilitated the proliferation of frauds such as so-called “Italian-sounding” product marketing — the use of words, images and geographical denominations which evoke Italy to promote products that have nothing to do with the country. These factors helped push the annual turnover from agri-food crimes to €21.8 billion, with a 30-percent increase. In this regard, the Ministry of Agriculture, Food and Forestry policies have concluded two important agreements with the leading e-commerce platforms Alibaba and eBay, and obtained good results after talks with Amazon: On the basis of this understanding, the ICQRF made almost 400 interventions on the three websites, with a 98-percent success rate, removing items from virtual shelves with a total value of €60 million. 800 Italian products marketed under protected designations of origin, including 41 PDO (protected denomination of origin) and 3 PGI (protected geographical indication) extra virgin olive oils enjoy now a greater protection on the web. According to the report, organic olive oil was the most controlled product by the Inspectorate for fraud prevention, along with cereals, fruits, and vegetables. Among the most significant actions carried out during the last year to safeguard the authenticity of liquid gold, the document mentions Operation Mamma Mia, which led to the seizure of extra virgin olive oil fraudulently labeled as Italian. Along with the expansion of agri-food frauds at the international level, efforts to tackle them are directed by a more global collaboration: the State Forestry Corps, now merged into the Carabinieri, has promoted in recent years the Opson network (named after ópson, which means “food” in ancient Greek), supported by the Interpol and the European police office (Europol), in collaboration with the Italian Minister of Interior. Fifty-seven countries have teamed up to collaborate with police forces in international activities, with a methodological approach that assimilates agri-food crimes to intellectual property theft, since they represent not only a food safety issue but also a violation of traditional values and collective interests. 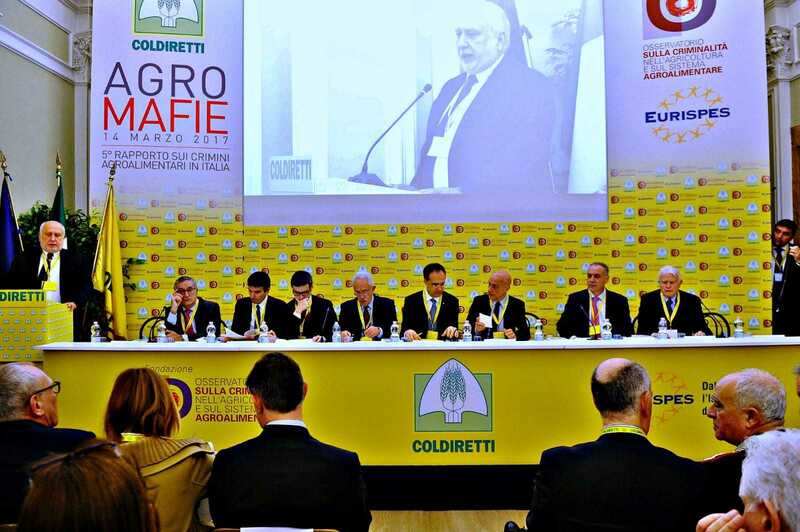 In this sense, according to the national anti-mafia prosecutor, Franco Roberti, a greater coordination of international strategies seems to be the right tool to defeat agropiracy. “The harmonization in the contrast of these crimes at the international level, as evidenced in other sectors, is essential to implement effective actions,” he pointed out. The report may be requested by contacting the Eurispes and the Observatory on organized crime in agriculture and the agri-food system.